For several years now I have avoided writing articles about general aquarium setup and design. Considering that most of my readers are advanced aquarists, there already exists an abundance of books and articles on tank set up, starting a tank is not as challenging of a project, I’m not really sure if I could provide any new or thought provoking concepts. Simply put, I’ve never found a reason to write such articles. That was until recently when a few of my friends demonstrated something I hadn’t paid much attention to: everyone who has an aquarium either just set up another aquarium or they soon will. 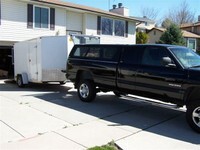 Knowing the location of where your aquarium will sit is tremendously important when planning the setup. This article is has been spurred on by several of my friends including Eric Borneman, Dave Nellans, Terry Siegel, Brad Syphus and my wife Marzena Blundell. This series began when my buddy Eric presented at the recent IMAC conference in Chicago, Illinois. Eric told a story of how his aquarium recently suffered catastrophic death and his plans to restart his aquarium. With sincere honesty and humility Eric spoke of his new role as a beginning hobbyist, as he once again formulates a plan to create a thriving ecosystem for his reef inhabitants. Finally my friend Brad Syphus set up his new aquarium. 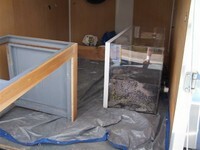 Brad faced many challenges in moving an aquarium a long distance, as well as adding many features he lacked in his previous setup. When two expert aquarists get together on a project who knows what could happen? That was the question when super reefkeeper Brad Syphus purchased the aquarium of well known author/lecturer Scott Fellman. After 1,500 miles of driving to Scott’s house and back, Brad discovered his newly purchased aquarium wouldn’t fit through the front door. 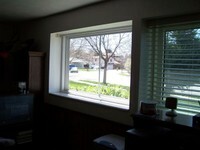 Lucky for Brad it would fit through his basement window. Even luckier for Brad is that he has a very lovely and forgiving wife who tolerated the renovating of their basement. This example typifies the unique challenges faced when moving a tank. Advanced aquarists have their own set of concerns and ideas when setting up an aquarium. They are not bothered with learning the basics, but instead are looking for the techniques and design to provide what they didn’t already have with their previous aquariums. Here are some examples where proper planning and foresight can pay off for the experienced hobbyist. Electricity serves in an unusual role in aquarium keeping. It may not directly affect water quality, chemistry, filtration or anything else affecting our tank inhabitants. However, it is tremendously important none the less. The vast majority of hobbyists are familiar with extension cords and powerstrips. The tangled mess of wires is all too familiar to this author. Some hobbyists now build there own “powerboxes” with all sorts of timers, outlets, switches, all combined with a clean look. Powerboxes are used by hobbyists to increase safety, reduce confusion, and simplify the electrical system of a home aquarium. While still a significant upgrade from extension cords, powerboxes still take a backseat to dedicated circuits. A dedicated circuit is basically what you house has for every room in the house. 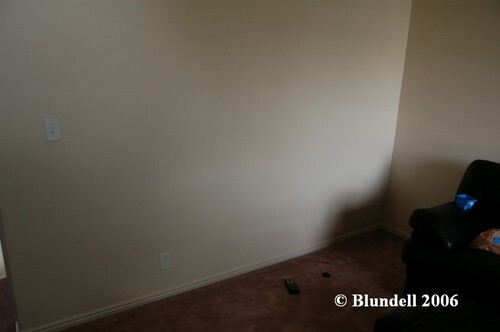 Your kitchen has its own circuit, your bedroom has its own circuit, your laundry room has a circuit. The great thing about this is that if something creates a short and the power is cut at the circuit (safety device tripping the breaker) your aquarium may still be running on its own circuit. Now of course this only helps if the circuit running the aquarium is not the circuit with the short (which it almost always is). For this reason advanced hobbyists are often encouraged to run multiple electrical circuits to their aquariums, and also to have electrical generators on hand for house-wide power outages. In order to maintain electrical supply my wife recently set up her new aquarium with THREE 20 amp circuits dedicated to the aquarium. While performing the electrical work for this aquarium the author had to leave the room. For some reason the stud sensor continuously lit up and beeped while he was present. Following that, the electrical circuits were added to the breaker and the outlets were installed in the wall. 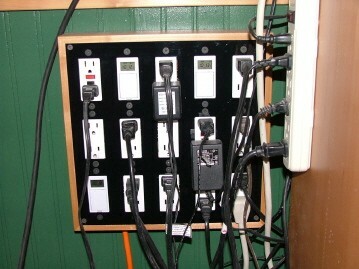 Each of these outlet systems are wired independently from everything else in the house. This allows the tank to be run from 3 completely separate power sources. The author certainly does NOT recommend you do this on your own but instead hire a professional. Plumbing is one of the most frustrating areas for hobbyists. The problem typically lies with one conundrum: you can’t tell how things are going to work until it is all set up and running; yet once it is up and running it is too late to make major changes. Quite the challenge indeed. This leaves many hobbyists adding powerheads, wave timing devices, water rotation and directional gadgets, and many other “add-ons.” Case in point is my wife’s aquarium. 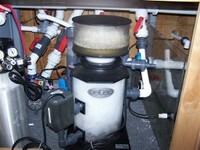 Wanting significant water flow for her 150 gal she knew she would benefit from closed loop systems. But how many? One, two, three, 10, 15, 42? How many drains and returns could physically fit? What would you do if after all the planning and set up it still wasn’t enough flow? What if it wasn’t the desired type of flow? What happens if you lose power to a circuit or to your house? That last question is to remind people of multiple circuits (as was described above in the electricity area). It is always a good idea to run your water circulation systems on different electrical circuits. Therefore it is important to plumb your system accordingly. Knowing what you want ahead of time can certainly prevent frustrations down the road. Shown here are the closed loop systems of Marzena Blundell. It is well worth the time to accurately measure and plan your plumbing system. 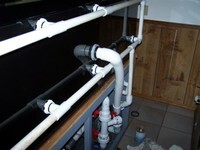 The idea here is to have a manifold system for the returns, as well as a drain system. These two items then directly join the pump. This aquarium features two closed loop systems that are mirror images of each other and are on separate electrical systems. 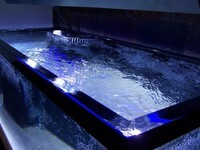 Shown here are pictures of a new system owned by expert reefkeeper Brad Syphus. The pictures help show the massive amounts of plumbing that can be used by hobbyists. There are many facets to tank setup. Experienced hobbyists often face a different set of goals and challenges from new hobbyists. For this reason the Once And Again series will focus on unique concepts for advanced tank setup procedure. I would like to thank several of my friends. During my time in this hobby I’ve been blessed to view and help set up several aquariums. I learn something new every time. Recently Dave Nellans, Brad Syphus, Eric Borneman, Terry Siegel and Marzena Blundell have all helped me to contemplate new ideas for reef aquarium setup. I would specifically like to thank my dad Gail Blundell and my grandfather Eugene Blundell for their instrumental help in setting up my wife’s new aquarium. The two of them are certainly able to design and build incredible bio-systems. Siegel, T. (2005/2006) A series of editorials by Terry Siegel describing the move he made of his aquarium from Massachusetts to Maine. http://www.advancedaquarist.com/articles/editorial. Advanced Aquarist Online Magazine, USA.